Mammoth elephant ear plants, also known as colocasia esculenta or taro, are a family of herbaceous perennial plants native to Southeast Asia. Colocasia esculenta earns the name mammoth elephant ear because of its heart-shaped leaves which can grow up to 3 feet long and 2 feet wide. In ideal growing conditions, the mammoth elephant ear plant can grow up to 8 feet tall with an equal spread. Mammoth elephant ear plants grow best in USDA plant hardiness zones 9 through 11, where the average annual minimum temperature is at least 20 degrees F. Outside of these zones, the mammoth elephant ear plant can be grown as an annual. Elephant ears look great when planted near water. Purchase firm mammoth elephant ear tubers from your local nursery or garden center. If elephant ear tubers are unavailable in your area, purchase tubers from a reputable catalog or online nursery. Select a suitable planting location for your mammoth elephant ear tubers. Mammoth elephant ear plants grow best when planted in a partially shaded location that receives at least four hours of direct sunlight each day. 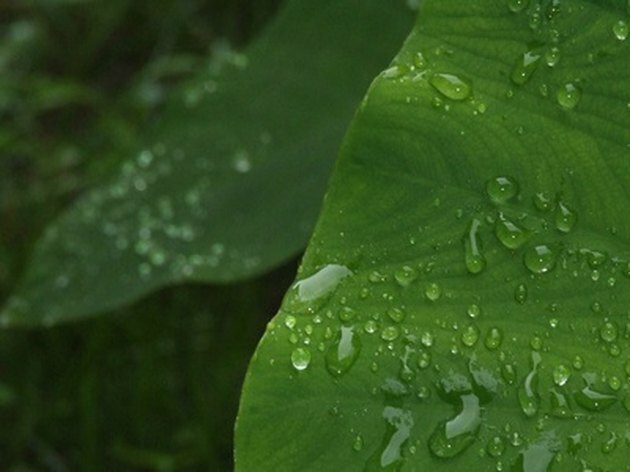 Unlike most other types of plants that require well-draining soil to grow, mammoth elephant ears thrive when planted in waterlogged soil near ponds, lakes and other bodies of water. Spread 3 inches of aged manure over your planting location. Cover the aged manure with 2 inches of fresh grass clippings. Till the amendments into the top 6 to 8 inches of soil. Dig a planting hole that is large enough to comfortably accommodate your mammoth elephant ear tuber when planted vertically. Dig the hole deep enough so that, when planted, the tuber will be covered by at least 2 inches of soil. Examine your mammoth elephant ear tuber to determine which way to orient it in its planting hole. Look for a round, bull's-eye like marking on one end of the tuber. Plant the tuber in its prepared hole, marking side up. Tamp down the soil at the surface of the planting hole. Water your mammoth elephant ear tuber with warm water immediately after planting. Wait two to three weeks for above-ground growth to appear. Continue to water your mammoth elephant ear plant as often as necessary to keep its soil wet. Fertilize your mammoth elephant ear plant once a month during its growing season to promote vigorous growth. Apply a water-soluble, quick-release fertilizer like Bloom Plus, Miracle-Gro or Grow More according to package directions.